I like that title, maybe I'll use it for my next novel. It may be overblown, but I'm just following up on an interesting thought posited by an anonymous poster (are there any other kinds? - don't you people have names, real or imagined???) on a post about the Nancy Brewster #8 well yesterday. 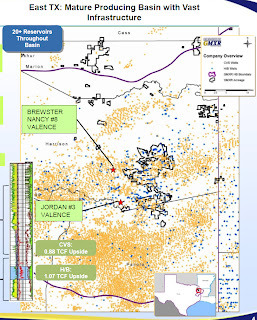 The commenter noted the seven "oil or gas" vertical wells permitted to 12,000 feet by STM Oil & Gas closely bunched together in Marion County, almost due north of (but +/-12 miles from) the Nancy Brewster #8. I find this interesting because it supports some other rumors I've heard from multiple sources about a narrow north/south oil trend running from Harrison to Cass County. Here is a link to a map of the STM wells that shows their location relative to the Brewster 8 and the GMX Haynes well in Marion Co. While this odd map may simply result from bad graphic design, I can't help but wonder if there is something more to this. I have to believe that it is no accident that the green Brewster bubble is very purposely placed since there is a very obvious better location to the lower left. Same with the blue bubble - there is a better location to the right or left. Hmmm...it looks to me that GMX purposely moved the two text bubbles to cover the company's leasehold north of the Brewster well. 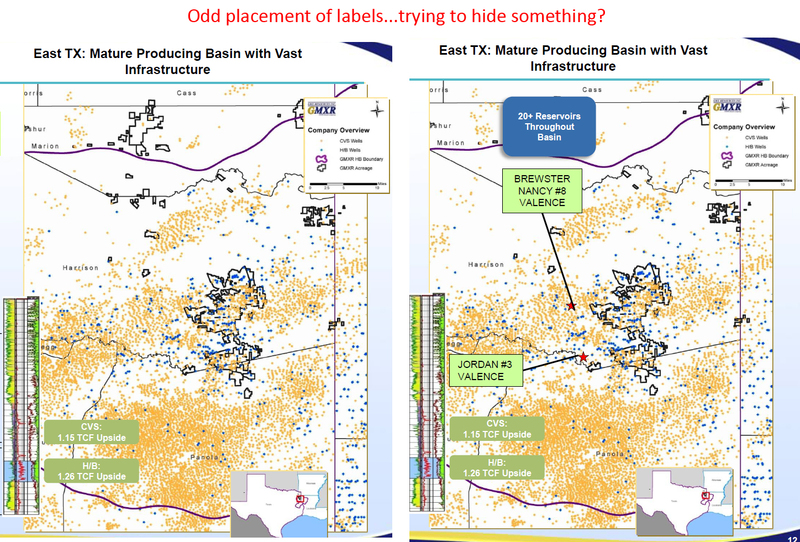 I don't know, but if there is something to the belief that there is a north/south oil trend west of Marshall, would you hide it in your investor materials? GMX certainly is not afraid of self-promotion. The company spoke of its pursuit of deep oil in the past and is not hiding the fact that it is re-entering old wells in that effort. But that work is on existing leases. I guess if you have found something of note but are still interested in leasing land, you might just sweep it under the carpet (or the text bubbles) for now. Makes sense to me. As always, I must state the disclaimer that this is speculation based partially on rumor and hearsay and is represented as such. Great detective work... "The Truth is Out There"
Check out the Frost Unit in Cass County...."Smackover Field" Look at the production report Mr. Hutchinson. Note that the map link brings up a plain map with no well information. Note that in May 2011 Devon pulled a permit for a oil/gas 12000 ft Hz wildcat right next the the Haynes. That Frost Well actually produced 2293 BBLs in Jan. Also note that the well is along the northerly line from the Nancy Brewster well. Try the link to the map now. I'll look at the Frost well later this morning. I don't know how much access you have to well logs, but if you can look at the density for the Welborne D N #1 (315-30570) drilled by Andover Oil back in 1981 down to 11500 which is fairly close to those STM wells, its tight as a tick when you get into the CV lime/haynesville Lime all the way to the bottom of the log. This well also has a mudlog, with no great shows in this depth too. Theres a Chevron deep test well, Dry hole BTW, pretty close to these too which goes down to 12500, but the log is trash. I would suspect these are just Cotton Valley wells with an amendable TD, a pretty common practice when permitting. For fun, I updated the Marion Co. map with the Frost well as well as another Frost well from 1986 across the road. The older well has been a steady producer, but I doubt a big E&P company is going to get too excited about 1,500-2,000 barrels per month. Robert, I'd take a well like the FROST, BERRY ET AL UNIT #1 any day over Niobrara or Bakken wells. That well has averaged about 1,500 BBls a month for 17 years. (Note the first 7 years may have averaged 1,000 BBls/month. In total it produced over 292,000 Barrels. This is in addition to 240 MCF of Nat Gas. Just rough numbers and since the Smackover flows consistently over 10 plus years it is a winner. Tom, No doubt that the economics are positive. I'm wondering if this is the target of what many people see as high intrigue on the part of folks like GMX, BP, Valence, etc. There has been increased activity in the courthouses and landmen prowling for leases in very specific areas. Something seems to be going on, but what? Is a band of Smackover or Cotton Valley worth the excitement? It is all about the Benjamins. Of course it is worth it. And oil, it has to be oil or very high NGL's. Dry gas just isn't worth much now a days. Oil has that certain cachet. If GMX, NFR or Valence gets a big enough land position it could add tremendously to the value of the company either in a current stock price or an IPO for a private company. Any leases being signed now will be for cheap money compared to an Eagle Ford play. Of course the rumors have to be proved true and the oil needs to be in sufficient quantities. And so we wait and watch. I suspect GMX will be the first to report. They are public and their stock price in bouncing along the bottom. That is also why I suspect they will be aggressive right up front to lock land up before they release the information by August 4th earnings report time. So I believe we will only have to wait another 6 weeks or so at most. Playing the Devil's Advocate for a little while, I'm trying to understand the newfound interest in this area. Why suddenly pursue that has been producing - mainly from one well in the area we've discussed - for 25 years? Before the Haynesville Shale "discovery," Cotton Valley was supposed be reborn through the new drilling techniques, but that was put on hold with the excitement (and huge lease bonuses) of the shale. So I can understand if this new activity is focused on a shallower formation, and there might be a sudden burst of "me too" activity to tie up leases now that dry gas is so unpopular. But it's the unknowns and incongruities that cause people to keep pointing to the deep oil. I don't have a horse in this race. I'm mostly fascinated by the interest and activity. The question that keeps coming back to me is why here, why now? All the activity might not be entirely out of the ordinary. It might be tainted by optimism and expectations. We won't know for a while. Six weeks? Six months? Longer??? Definitely worth watching. I was following McMoran (MMR) and their ultradeep gas and potential oil plays. They have the Davy Jones and Blackbeard wells that have been waiting on testing for some time now due to the special equipment needed for the high pressure source. 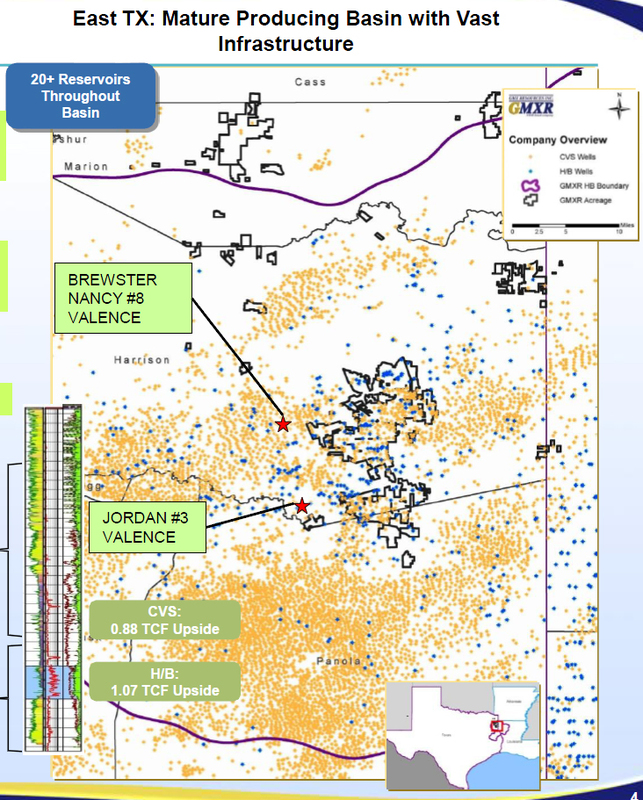 MMR feels they are reaching into the same formations that the deep water drillers have found.Chevron came out in a presentation earlier this year supporting MMR's findings. Note that traditional seismic data did not show the deposits due to the presence of the salt layer. The key to MMR's finds is the salt weld keeping local temperatures cool allowing oil to be found at depths not normally occurring due to high temperatures. And once a gusher was found (or rumored) near the salt line in the East Texas Basin my ears perked up. 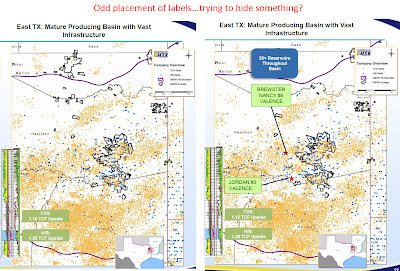 I suspect GMX has plenty of ears and eyes on the ground and would not have included the Nancy Brewster or Jordan wells in their presentations unless they have some evidence of oil production from those wells. The technology has moved forward and drillers have the ability to reach the Norphlet and produce and resources present. A while back I found this interesting presentation. It includes a couple of pretty seismic pictures of just the north south structure we have been discussing. I have posted these separately. This data is mentioned as being BP's interpretation of this region. Think of the Louann Salt as being the ice pack in the cooler. This is from a February 2011 presentation. I needed to break the link in two in order to publish it. Boy, Tom, you sure do lots of work early in the morning! Good stuff, thanks. I am not a geologist, but I love the analogy of the salt layer being the ice pack in the cooler. It's an image I can get my mind around. You can't compare the smackover to the niobrara or the bakken, its not a resource play, its apples and oranges. Drilling a good smackover well is very cost dependant seeing as you have to have seismic, you have to deal with H2S, you have to have a paleohigh, be on the right side of the fault, etc. how many failures for one success? Remember why shell had to evacuate the entire town of jackson, ms because of a smackover well? Looking at one well like the Frost well tells you nothing about the play over all. Jeff, to me the Frost well shows a potential target. Moderate oil flows for 10 - 20 years. The cost of the vertical well is cheap compared to the horizontal wells being used in the Haynesville, Bakken etc. The economics are outstanding, if of course they don't hit many dry holes. However it is only hard to do until they apply some time and effort to mastering the technology of the play. Again there may not be anything to it, however then again there may be a lot to it. Frost lines up with what I have heard the area of interest...running south to north along 59 then veering northwestward out of Linden to the Sulpher river and maybe a little north of that into Bowie. Anybody else heard this? Maybe its' like the Haynesville. The further south they have gone the better the wells. When they first started it was Caddo/Desoto now its Nac, Shelby, San Augustine. Maybe its the same here the southern Harrison county wells might be stronger producers than northern wells? Just a thought. The new pending permit for S.E. MATTHEWS A 2H 3 miles NE of Beckville puts it near the Sterrett wells. and just north of Chevron's Emma Eddy 16,00 ft oil/gas well. At 18,500 ft Chevron must have some confidence in the value of deep drilling. 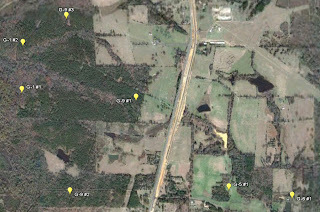 Any updates on any of the wells looking for oil under the Haynesville? Nothing particularly new. I think the commodity price shocks have caused producers to play it safe with their budgets and not do a lot of low value exploring. After looking into it for a while, it seems as though if there is something down there (most industry types say this is somewhere between unlikely and impossible), it is probably going to be in discrete pools and not in some kind of large formation. This would make it a hunt and peck kind of affair, and there aren't too many folks out there these days willing to risk a dry hole after putting up millions to drill a well.